The e-learning programme in Dementia Care has been designed to enhance the training and education of the health and social care workforce. It focuses on the essential knowledge and skills needed to support and enable people living with dementia and their family carers to live as well as possible, wherever they live. The programme will also be of interest to those responsible for training and educating the health and social care workforce. It can be used in a variety of ways including as part of induction; to structure reflective practice with individual staff and teams; for self-paced learning; and to revisit as a form of refresher training. The programme directly addresses the Prime Minister’s Challenge on Dementia 2020 by covering all aspects of care for people living with dementia and their family members, from prevention and risk reduction to diagnosis through to bereavement. It emphasises the importance of adopting the perspective and experience of those directly affected by dementia – people living with dementia and their family and friends – and ensuring effective support is provided to health and social care professionals charged with providing compassionate, co-ordinated, evidence-based person-centred dementia care. The programme is aligned with the Dementia Action Alliance Dementia Statements. The programme draws on a rich and diverse evidence base including personal testimony – the voice of the person living with dementia and their family carers – national and international care and services research, and professional and clinical best practice. The content reinforces the importance of dementia being everyone’s business and the importance of having a workforce that is both well-informed and supported to provide high quality, compassionate care. The sessions have been written by people living with dementia and their family carers working in collaboration with a multi-professional team with backgrounds in education, gerontology, nursing, occupational therapy, patient and public involvement, pharmacy, psychology and speech and language therapy. If you already have an account with e-LfH, then you can enrol on to the Dementia programme by logging in to the e-LfH Hub, selecting My Account > Enrolment and selecting the programme. You can then access the programme immediately in the My e-Learning section. In the event that you do not qualify for free access to the Dementia programme, you are able to license access through eIntegrity, a community-interest company established for this purpose. For more information on the licensing options available for the Dementia programme, please visit the eIntegrity website. To register for the Dementia programme, select the ‘Register’ button, above. Select the option ‘I am a care home or hospice worker’ then enter your care home / hospice name or postcode and select it from the options available in the drop down list. Finally enter your care home / hospice registration code and select ‘Register’. You may need to see your employer to get this code. Access to e-LfH content is available to all social care professionals in England whose employers are registered with the Skills for Care National Minimum Data Set for Social Care (NMDS-SC). Every employer providing NMDS-SC workforce information to Skills for Care has been given a user registration code for their staff. This code enables you to self-register for access to Dementia. Please contact your employer for more details about the registration code. For information about registering your organisation with the NMDS-SC your employer should access www.nmds-sc-online.org.uk or contact the Skills for Care Support Service on 0845 8730129. 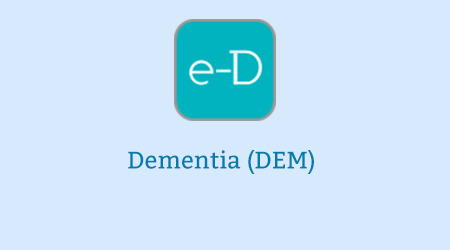 The Dementia programme is also available to NHS healthcare staff via the Electronic Staff Record (ESR). Accessing this e-Learning via ESR means that your completions will transfer with you throughout your NHS career. The Dementia Awareness and Person-centred Dementia Care sessions from the Dementia e-learning programme are freely available to all, with no registration required. Should you require a record of your activity or a certificate of completion, you will need to register.